If it’s Thursday that means it’s Food Network’s #ComfortFoodFest and I’m not sure much brings to mind comfort food more than a simple grilled cheese. Without a doubt one of my earliest memories of food served at our family table, most often for lunch and always in winter. I guess the truth is that while it took me some time to embrace the ‘vegetableness’ of soups (split pea Mom? Ew!!) or the spice of chili, I don’t recall ever resisting cheese, much less ooey gooey cheese on a buttery toasted sandwich. Some things never change. This sandwich was partly inspired by a fellow who goes by the name of Chef John; known more for his video series than his blog. He does simple videos with voiceovers and has a widespread audience. I don’t remember when I first heard of his Inside Out Grilled Cheese but it’s been awhile. The notion came to me while I was contemplating what to do for today. My first inclination for a day devoted to grilled cheese was to make Cubano’s and actually I did. I made a huge amount of them when I had my neighbors over this past Saturday for dinner. Ten adults and 8 kids and while I had made enough roasted pork for an army, by the end of the night I was out of rolls and Swiss cheese and getting more done for this post and photographs would require a trip to the grocery store. In a snowstorm. Um, no. As I was cleaning off the griddle and thinking about what to do next, I enjoyed some of those crusty bits that are always left from the melting cheese, that made me think of the Parmesan crisps I had made recently and a light bulb went off remembering Chef John’s clever use of cheese on the outside so there I went and the rest is history. Some people call what we do ‘recipe development’ but for me it’s more ‘stream of consciousness.’ I’ve never once sat at a table and configured a recipe; I just sort of start making something! That being said, I checked out John’s video AFTER making my sandwiches. Oh boy, would I be in trouble. But I thought it was good trouble. John insists on white Wonder type ‘insignificant’ bread. I had my favorite oat grain bread. His was all cheddar but mine had to have some Parmesan and while I was at it I threw in some Monterey Jack too. Mostly out of providence because I only had a bit of each but I’ll tell you the mixture of Cheddar, Parmesan and Monterey Jack was meant to be; especially combined with some baby tomatoes; another must have for me. I’ll be honest, I NEVER use regulation size tomatoes during the winter but I can squeak by with some of the little ones, they are juicy and have some flavor that their larger relatives are lacking and heating them only helps. This sandwich is a bit decadent but so worth it. Crispy cheese on the outside and gooey cheese on the inside? How could that not be fabulous right? I used a Panini press to make the Cubano’s and it was still on the counter so it did make these so easy (Now I’m hooked and contemplating leaving that never used appliance out ALL the time). But still, nothing all that difficult if using a griddle or frying pan. I found it easiest to just scatter some cheese on the griddle the approximate shape of the bread I was using and then placed the buttered bread on top. The press meant I didn’t have to turn them over but if I had, I would have just lifted a sandwich, sprinkled some cheese in place and flipped the sandwich on top of the cheese. These take comfort to a whole new level; so good and so warm and without a doubt I have to give a big part of that to the Parm. I’ve never used Parmesan in a grilled cheese sandwich before; now I’m not quite sure I could ever make one without. Add a bowl of tomato soup and I think you have the perfect meal! Warm your skillet or griddle on high heat. Butter one side of each piece of bread. Sprinkle 2 Tbsp of cheese mixture in 3 areas on the griddle; top each area with a slice of the bread, buttered side down. 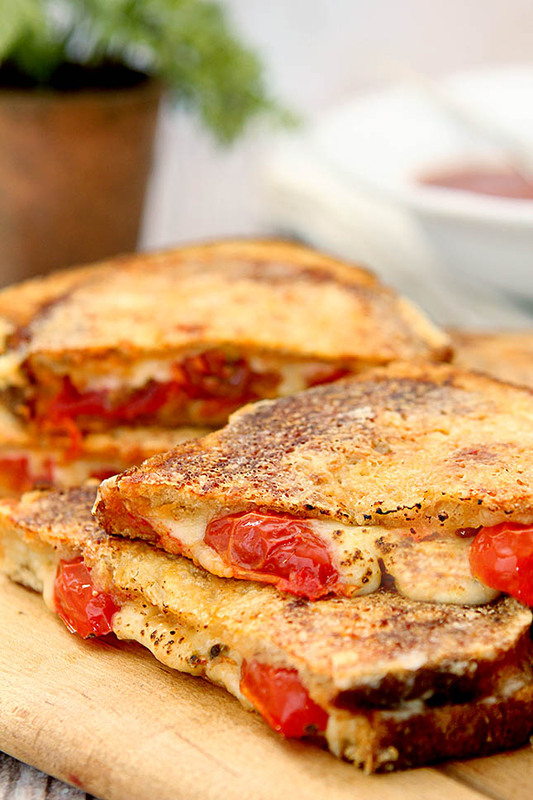 Sprinkle 1/4 cup of the cheese mixture on each slice of bread and top with the sliced tomatoes. Place the 2nd slice of bread on top. If using a skillet DO NOT sprinkle the remaining cheese on top of the bread. Grill until the bottom is browned. 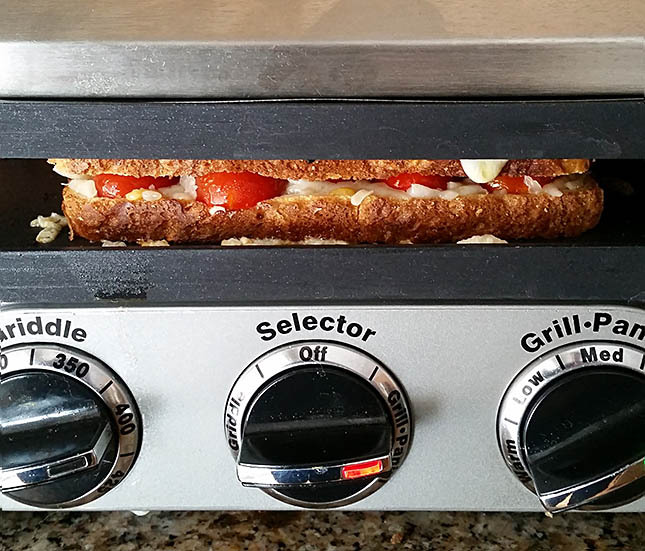 Remove the sandwiches to a plate, sprinkle 2 Tbsp of the cheese on pan or griddle and then flip the sandwiches over onto the cheese. Grill until the bottom is brown; remove to a platter, cut in half diagonally and serve. After putting the 2nd piece of bread on top, buttered side up; sprinkle 2 more Tbsp of cheese on top of the buttered bread and close the unit until the cheese and bread are browned and the inside cheese has melted. Don't really 'press' it, just close it enough that both sides can get browned. 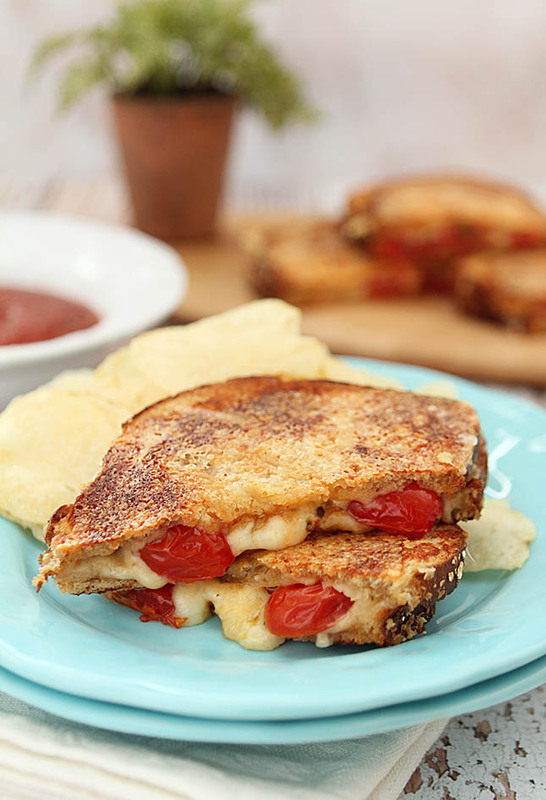 Join me and my fellow #ComfortFoodFeast friends for some great ideas for Grilled Cheese! I’m loving the cherry tomatoes…and of course all the cheese! This looks great! Thanks Aggie and if you’ve never done it like this before, do try it. Yes a bit indulgent but oh so good too! First time I’ve heard of inside out grilled cheese. I like it! I like it a lot!! It is a bit addictive; did one again today with roast beef and Swiss. I have yet to put away that griddle! You made my American heart sing with this cheese sandwich! Now that is my kind of sandwich!!! And I’m with you Barb – I love tomatoes with grilled cheese! !